A time to be empowered and encouraged alongside those who share your calling to minister to our neighbors living in senior adult care homes. Enjoy a delicious catered banquet, testimonies about how Jesus is working through nursing home missionaries, and a new ministry resource gift to help make your outreach more fruitful. The evening will include an inspirational message from Rev. Yvonne Hobson, a 20 year veteran of the nursing home mission field. This night is reserved for those involved in sharing God’s love and Word with people in senior adult care homes. In order for people to age well, they must know how to navigate through loss and undesirable change. Significant losses are the primary reason for grief, and grief can overshadow us with hopelessness. Every resident we meet in a nursing home has experienced losses that have significantly altered their lives. The Lord can use you to be a friend who understands and walks with them through this valley and into His peace. 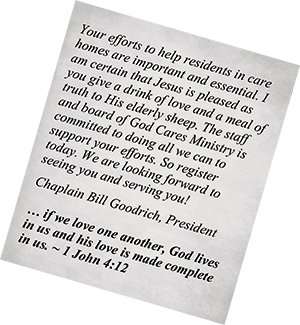 Chaplain Bill Goodrich and Pastor Dennis Barta (along with a few experienced guests) will share how you can become a tremendous support not only to the residents, but to caregivers and other nursing home missionaries as well. You will learn Biblically-based principles to shine the Light of Christ into the heart of a friend that is journeying through the valley of the shadow of loss and grief. There is no cost for PowerNight or the training workshop, but a freewill offering will be encouraged.